Here are a few pictures I took of some lillies. I actually took these with the camera on my cell phone. I noticed them while on a bike ride, with the kids, a few weeks ago. I have never seen "red" lillies before, and thought they were a beautiful color. And since I didn't have my regular camera on me, I still wanted a picture, so snapped it with my cell phone. Despite being taken with a camera phone, the quality is still pretty good. 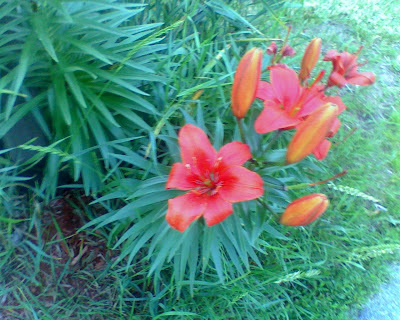 I have never seen a red lily before too; the ones I saw before were usually white or pink with traces of white. My R T is now posted if you'd like to stop by and view. Have a great day! Very good cell phone pictures. You should be a photographer. Beautiful red lilies. We see lots of oranges, yellows and deep burgandies around here but I don't recall seeing any reds. I know the feeling about cell phones. I walked out without my camera the other day (Lord, it was like walking out without my lipstick in my purse) but my cell phone came to my rescue. I'm doing a post in the next couple of weeks doing show and tell with the cell phone pics. I wish I could grow stuff! They are so pretty! Your cell phone takes great photos. I love the color of those photos. Beautiful Lilly's, Sue. You must have a pretty good cell phone if you can take photos like that with it. Lovely red Day Lilies ... impressive photos taken with your phone. WOW! I haven't seen red ones either. They are pretty, I'm glad you had your cell phone with you. Those are nice lily photos. 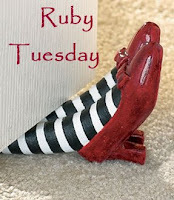 I really like the Ruby Tuesday pic of the slippers on the Wicked Witch of the East too! Those are gorgeous lilies. I've not seen the red ones before. I have orange ones in my garden. Very pretty. My neighbor down the road has them. This was the first year I saw them. Terrific capture of a memory! They're gorgeous! Nice cellphone shot. 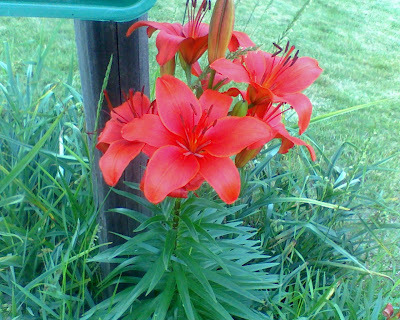 The unusual red lilies are beautiful and you did a great job with the cell phone camera! I haven't mastered mine yet, that's for sure.